Love them or hate them, mototaxis have become an almost iconic form of transport in Peru. Like their international counterparts -- auto-rickshaws in India and Sri Lanka, “baby taxis” in Bangladesh, and tuk-tuks in Thailand -- Peruvian mototaxis provide a cheap way to get around many of the nation’s towns and cities. Mototaxis first appeared in the jungle regions of Peru during the 1980s, with most vehicles arriving from India. By the 1990s, the mototaxi boom had reached Lima and soon spread along the Pacific coast. Mototaxis are now found throughout Peru, but jungle cities such as Iquitos, Tarapoto and Tingo Maria still have the highest number of mototaxis per person. In both high and low jungle settlements (selva alta and selva baja), roads are often dominated by these three-wheeled contraptions. People in the jungle regions also like to engage in mototaxi racing, otherwise known as Motokar Cross. There are two main types of mototaxi in Peru. The most common is the converted motorcycle with the bench seat in the rear. 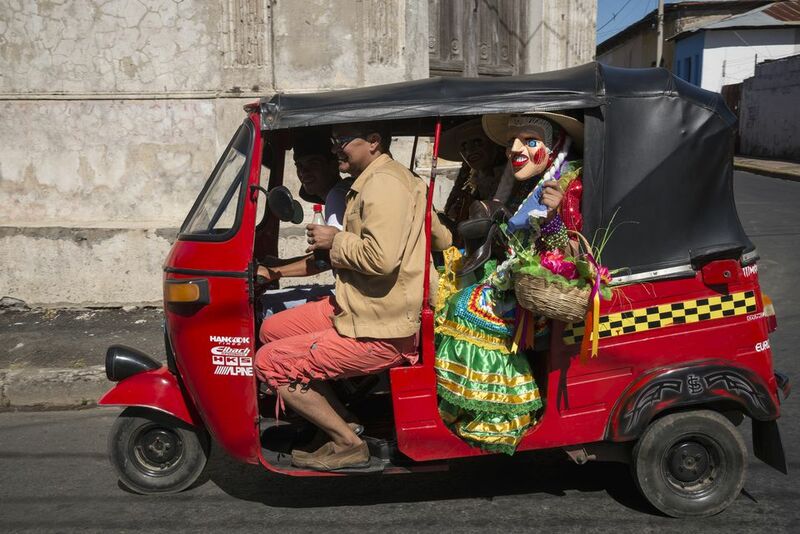 In some towns, you’ll also see the small-wheeled trimovil, a three-wheeler with a more rigid, almost totally enclosed cabin. You’ll sometimes hear the word Bajaj used to refer to a trimovil; Bajaj is actually one of the main trimovil manufacturers, but the word has become a generic term in some regions. The enclosed trimovils have less room for passengers, but they offer more protection in the rain. They can also be converted to run on gas (mototaxis a gas). Mototaxis buzz around all day looking for passengers. There are no set routes, so just flag down a driver, arrange your price and hop in. In some towns, you’ll find mototaxi stops (paraderos) that serve set destinations. These mototaxis typically run between towns and villages. Mototaxis are cheap and good for short hops. A trip of five or six blocks can cost as little as S/.1 (US$0.35); for S/.5, you can cross the entire extent of a mid-sized town. Always arrange the price before accepting the ride. If you don’t, the driver might hit you with an unreasonable fare on arrival, at which point it’s hard to negotiate. Mototaxi fares are normally set by distance alone, not per person (unless they are running along set routes, in which case the fare may be per person). In theory, the price for two or three passengers should be the same as for one passenger. The driver might increase the fare due to the extra weight, especially if you are stacking luggage on the vehicle. Prices also vary depending on the time of day (prices tend to rise on Friday and Saturday nights) and the quality of the route (higher fares along bad roads or steep climbs). You do not need to tip mototaxi drivers in Peru. Drivers do not expect a tip, so any bonuses are entirely up to you. Mototaxi drivers have a reputation for being reckless and ignoring the laws of the road. Avoid taking mototaxis along heavily trafficked roads, especially on roads dominated by much larger vehicles such as trucks and buses. Mototaxis offer no protection at all in collisions with larger vehicles. If you flag down a mototaxi and the vehicle looks in poor condition (or if the driver looks inebriated), don’t hesitate to turn down the ride for a better option. Mototaxis don’t have safety belts (or any other safety features). Keep your arms and legs inside the frame of the vehicle. Think of it as a rollercoaster ride -- a comparison that, at times, is all too appropriate. Will Your Driving License Be Valid in Peru?